We all know that the Cataclysm brought about the destruction of the northern icy peaks of Twilight Highlands, the zone known as Northeron in the Lore. I checked the Chronicles Map and some fun made projects like the one of Kuusinen and honestly I was a little disappointed. Does anyone know actually how Northeron looked before ? Perhaps a map or something would be really dope. Last edited by AndreiOptyck; 04-13-2019 at 01:29 AM..
up still searching for answers. There are no maps of canon Northeron. The main issue with Northeron is that both its location and nature changed between Warcraft II and World of Warcraft. Oroginally, it was said to be far in the north of Lordaeron, bordering Quel'Thalas. Only Cataclysm retconned it to the Twillight Highlands. I decided to distinguish that northern zone as Northaeron by Northeron. I know for someone who is English native they sound the same but a foreign a and e together aren't pronounced as e when together but as a and e.
So there is no official map then ? 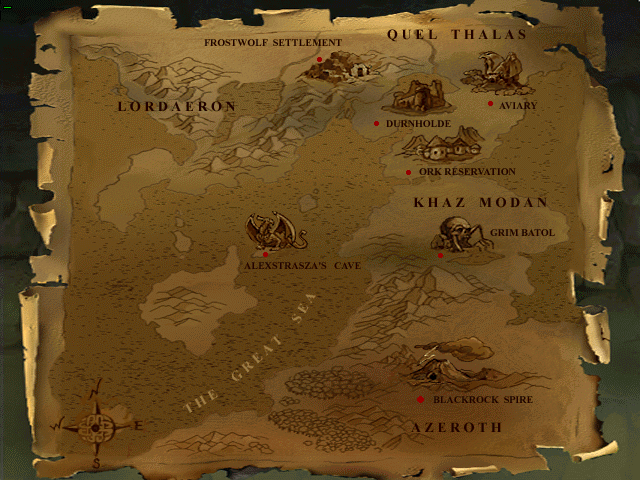 I looked at the chronicles one but all it does is to use the pre cata map with scrapped zones and the large peninsula of gilneas. I like to think the map from Warcraft Adventures: Lord of the Clans is telling. It doesn't show "Northeron", but it identifies a gryphon rider Aviary in a spot where *I* think Northeron may have existed in old lore. East of Darrowmere Lake, south of Quel'thalas. Going by the Warcraft II concept maps, the Day of the Dragon reference, and the Warcraft II 3D map from the console version, I'd say it was further north, northeast of Darrowmere. Maybe not the red dot on that map, so much as the gryphon's head! Hehe yeah, but then again, one can easily even include the red dot as being somewhere near the southern border while the center lies further north, where the head is.